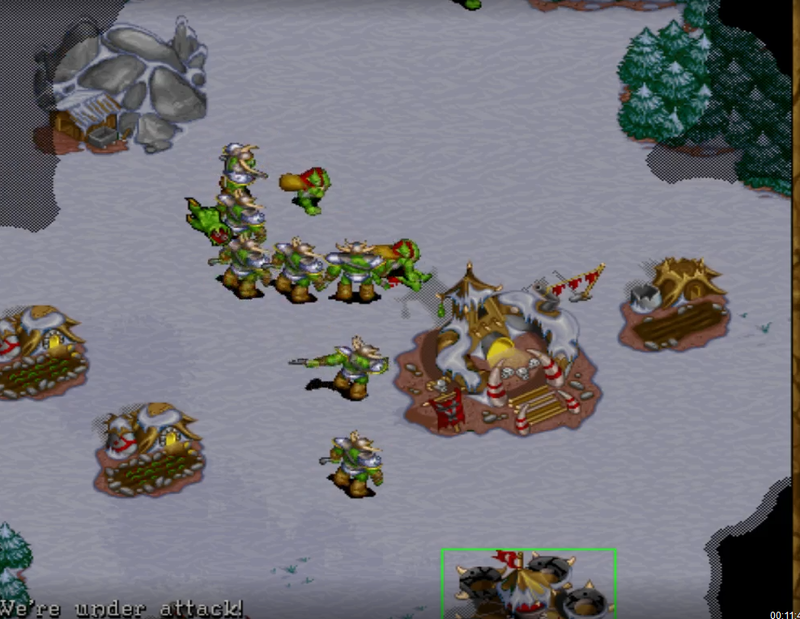 The first tutorial video for how to play Warcraft 2 has been released and covers the topic of wall-ins and chokes, or how to defend your base from attacks. The information in the video will be presented here in text with images for those who don’t have the ability to watch videos or who just prefer reading. A new player just starting out is likely to die from their opponent’s first grunt rush (or group of grunts) if they haven’t yet learned how to wall or choke, as shown in the image below. A basic wall would be made of buildings you build to block the opening(s) to your base, with a guard tower on the inside of your base. You need to leave room for peons to repair the buildings forming the wall so the wall doesn’t die as quickly. 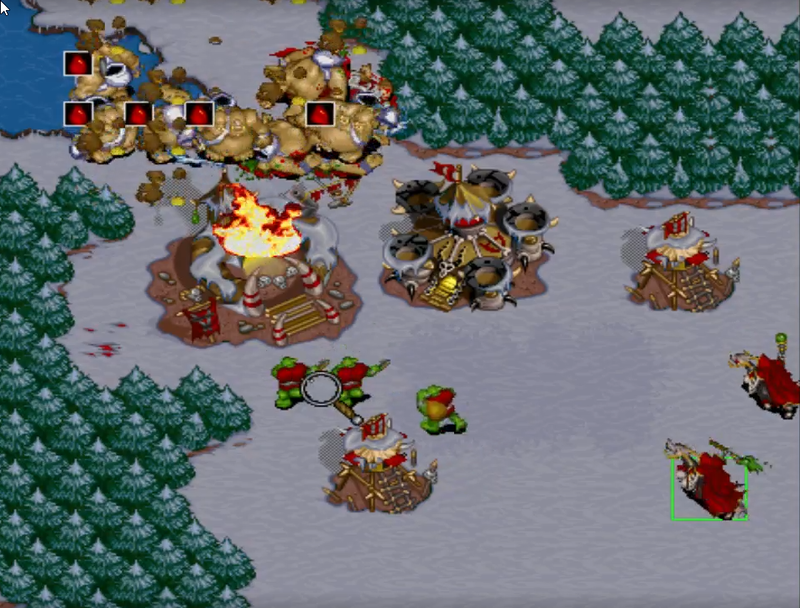 If you build a barracks that can produce units into your base (units normally pop out of the left side of buildings), you also have the option to build an archer or axethrower to attack enemy units behind your wall, which are faster and cheaper than towers or catapults, but do less damage. If you have a large number of enemy grunts that have weapons leveled up, you will probably need a catapult to keep your wall from dying to the enemy’s grunt rush. Another type of wall is a unit wall, or your own grunts forming a line where you have selected them all and hit the hot key “T” for “Stand ground”. This way, they won’t break formation even when attacked. 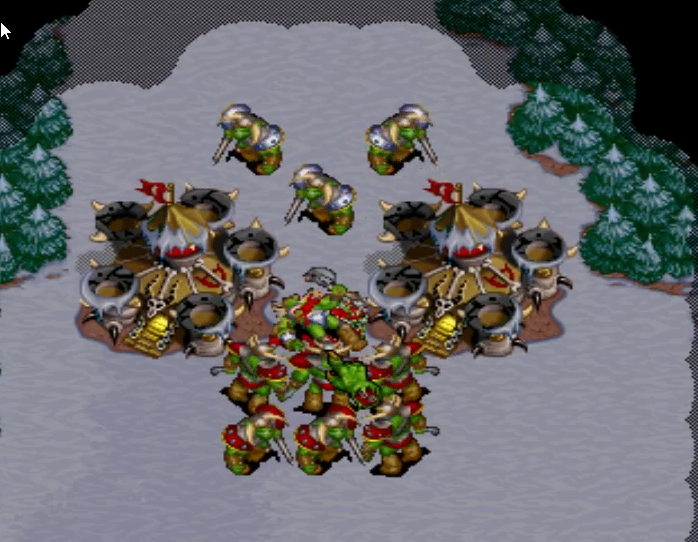 The wall of grunts on “Stand ground” hits the incoming grunts first, and they generally hit 2 or 3 at a time at each incoming enemy grunt, giving the advantage in the grunt battle to the unit wall of grunts. 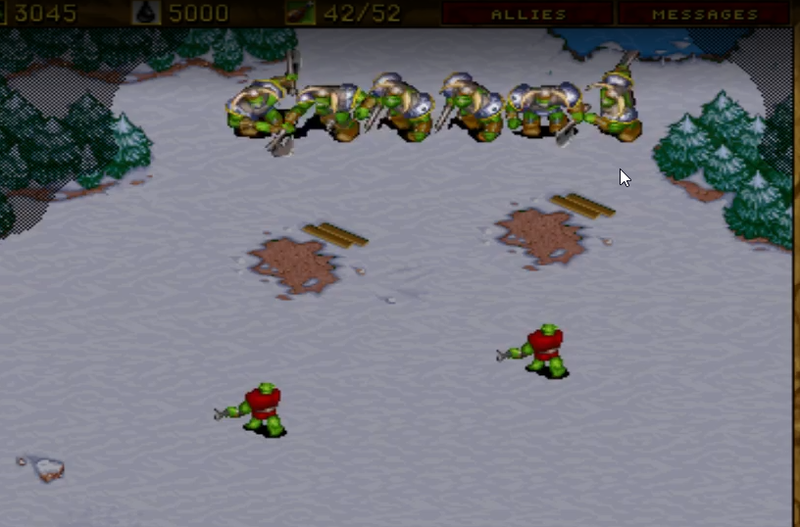 It the grunts are the same level and the same number, the unit wall should win the battle. The unit wall also gives you a little bit of time to place a building wall behind the unit wall, in the event your unit wall dies to a group of enemy grunts of higher level or greater number. 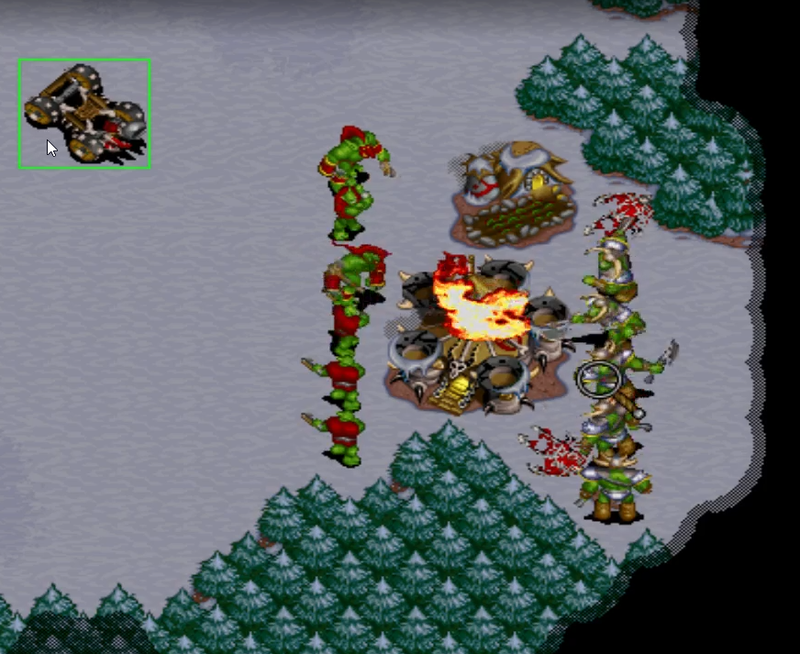 In this case, the incoming grunts were level 5 and the grunt wall was made up of level 2 grunts, so the unit wall died, leading to an emergency wall-in with two buildings being repaired by peons in the base. A choke is another way to defend your base from an enemy’s grunt rush. It involves having a sort of tunnel or narrow opening so that you have more units able to hit fewer units that can fit into the tunnel. Here is an example of a 3-to-1 choke. The 3 grunts forming the choke need to be set on “T” or “Stand ground” command. The grunts behind are not on “T” so they will move forward to replace any that die. If the opponent were to send all the level 5 grunts into the level 2 grunt choke as happened here, the level 5 incoming grunts would all be killed. Only one of the grunts forming the choke died, and was replaced by a standby grunt. Careful with this set-up though, as the enemy can reverse choke you above your barracks, and keep you trapped in your base. 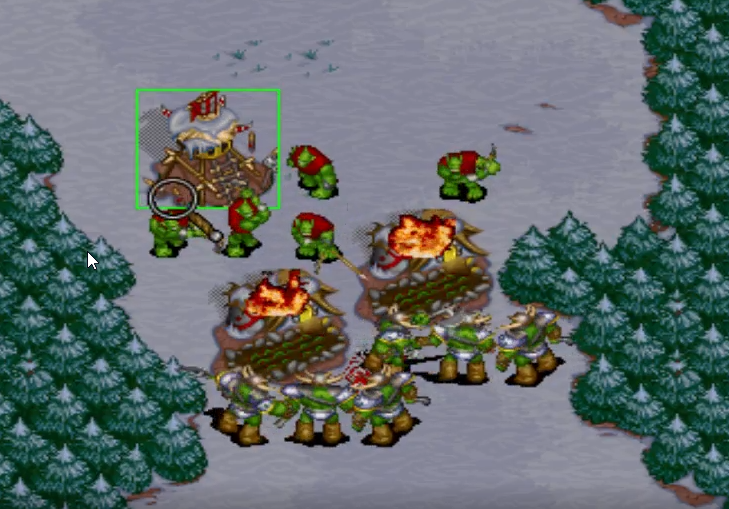 You would want a ranged unit (guard tower/cannon tower/axethrower/catapult) inside supporting that choke set-up to prevent that from happening. You do not want to be trapped in your base or have your opponent’s grunts choking and killing your barracks as you helplessly watch the destruction. In late game, you will need a more powerful defense than these to survive against bloodlusted ogres. Bloodlusted ogres are superpowerful and can make short work of your entire base if you don’t have an adequate defense set up. The great hall is the biggest building and has the most hit points, so makes a strong wall to protect your late game expansions when lust is in the game. Behind that hall, you will want to have a cannon tower, or sometimes two are seen when resources allow for it, and death knights or mages inside your base. You may need more than one building to block the opening to your base if the opening is wider than a hall will cover. Here a deathknight is casting death and decay on the bloodlusted ogres as two cannon towers shoot at the ogres while peons repair the hall. This defense worked very well here. Avoid weak wall-ins whenever you can. This example of a weak wall-in allows 7 grunts to attack the barracks while there is only room for 2 peons to repair it. The damage far exceeds the repairs and the building will fall, and fast. There isn’t time to make a tower or catapult to defend. You can still re-wall if you’re fast enough, but you will have lost an important building and the ability to make attacking units from it, which puts you in a weaker position. 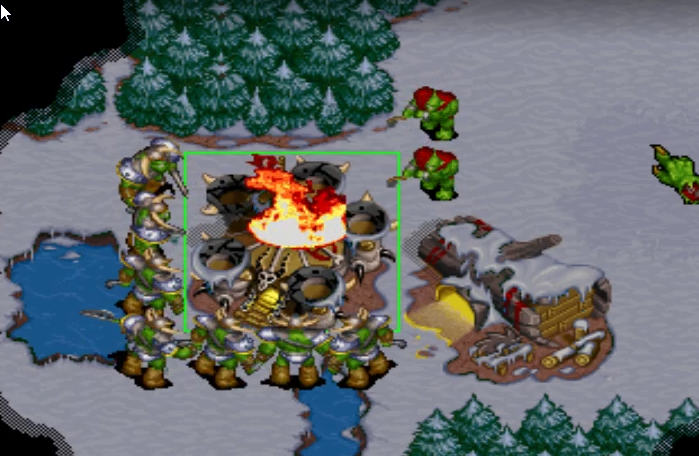 You want to minimize the attacking units that can fit on the other side, and maximize the number of repairing peons that can fit on the inside to repair your walls. And if you notice your wall dying and don’t have time to get a defensive ranged unit or building, be ready to re-wall fast so the enemy grunts don’t get inside your base to kill everything you have.